The seven Rhoden family members killed and family friend Hannah Gilley murdered in 2016. 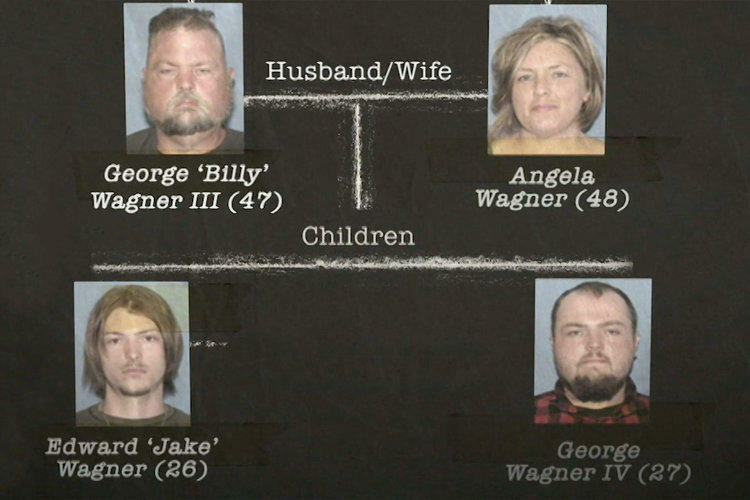 Nearly two-and-a half years later, four members of the Wagner family were arrested and charged with the slayings: Jake Wagner, George Wagner IV, George "Billy" Wagner and Angela Wagner. The grandmothers and matriarchs of the Wagner family, Rita Newcomb and Fredericka Wagner, also were charged with allegedly helping cover up the crimes. Beth Karas hosts the special which "delves into a complicated and horrific massacre" on Oxygen, "the (TV) destination for high-quality crime programming." "Through the eyes of local community members, family, friends, local law enforcement and journalists, The Piketon Family Murders pulls back the curtain from the frantic 911 call all the way up to the pre-trial hearings as bombshell revelations are brought to light, the network announced. The victims were Christopher Rhoden Sr., 40; Gary Rhoden, 38; Dana Lynn Manley Rhoden, 37; Christopher Rhoden Jr., 16; Hanna May Rhoden, 19; Clarence "Frankie" Rhoden, 20; Kenneth Rhoden, 44; and Hannah Gilley, 20. Here's a link to three video previews on the Oxygen site. New York, NY – Oxygen Media, the destination for high-quality crime programming, presents a gripping two-hour special, "The Piketon Family Murders" premiering on Sunday, March 31 at 7 p.m. ET/PT. Hosted by Beth Karas, the special delves into a complicated and horrific massacre that stunned the small town of Piketon, Ohio, when in 2016 seven members of the Rhoden family as well as Hannah Gilley, the fiancée of one of the victims, were found murdered in a cold-blooded killing. For more than two years, the residents of Piketon lived their lives in fear, hoping day in and day out that law enforcements would find the individuals responsible for the killings as rumors started swirling the town. Through the eyes of local community members, family, friends, local law enforcement and journalists, "The Piketon Family Murders" pulls back the curtain from the frantic 911 call all the way up to the pre-trial hearings as bombshell revelations are brought to light.